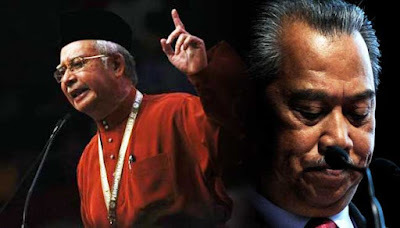 © Absolute Misdemeanor™®: Will Muhyiddin be sacked from Umno on Sept 9? Will Muhyiddin be sacked from Umno on Sept 9? “Operasi Kedua” likely to see a purge in Umno involving Kedah and Perak as well but sparing Sabah and Johor for now, says political analyst Shahbudin Husin. Umno Vice President Shafie Apdal, sacked from the Cabinet on July 28 in a reshuffle, and Umno Johor Chief and Menteri Besar Khaled are expected to be spared the kind of disciplinary action to be taken against Muhyiddin: i.e. bringing the party into public disrepute and contempt and smearing the name of party president and Prime Minister Najib Abdul Razak. “Shafie was expected to be wooed slowly back into the folds of the party and supporting Najib again,” said the analyst. The evidence stacked against Muhyiddin, said Shahbudin, includes statements he made during several divisional annual general meetings in the past two to three weeks. Muhyiddin, it’s alleged, harped among others on the RM42 billion 1MDB Scandal and the RM2.6 billion in Najib’s personal accounts. Shahbudin disclosed that a high-ranking party official at the Umno Headquarters, apparently close to the party president, confided in a source recently that “Operasi Kedua” (2nd Operation) would be launched soon. The operation, to purge Umno of all dissident elements, was expected to rid the party of all problems facing Najib, according to the source, said Shahbudin. Operasi Kedua apparently follows the first move on July 28 when Muhyiddin was sacked as Deputy Prime Minister on the same day that Shafie lost his Rural Development Minister’s post. The Umno Supreme Council was earlier scheduled to meet on July 31, three days after Muhyiddin was sacked as Deputy Prime Minister, but it was put off. Also put off was Najib’s series of meetings with Umno divisional chiefs throughout the nation regarding the RM42 billion 1MDB Scandal and other issues. The July 31 meeting was first postponed to August 28, and now the latest date is September 9.